Home Letter of Credit Basics How to Handle a Letter of Credit Which Contains a Joker Clause? How to Handle a Letter of Credit Which Contains a Joker Clause? By reading this article, you can learn what joker clause means in a letter of credit transaction and why it is a source of problem for the exporters. “A credit should not require presentation of documents that are to be issued, signed or countersigned by the applicant” says International Standard Banking Practice (ISBP 745) in its preliminary conditions section. 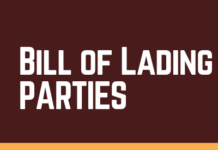 Sometimes importers or importers’ banks attempt to include such clauses in letters of credit. On this page I will examine the letters of credit that request a document to be issued, signed or countersigned by the applicants. A letter of credit is issued by the issuing bank with the request of and instructions given by the importer. Importer also known as the applicant. The letter of credit is issuing banks irrevocable and conditional payment undertaking. 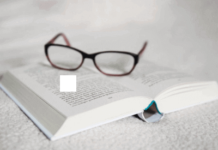 Which means that the beneficiary of the credit will be getting paid by the issuing bank against the presentation of required documents and provided that all terms and conditions of the credit are complied with. Under normal circumstances a beneficiary should be able to collect all of the stipulated documents without the intervention of the applicant. This is how a reasonable and decent letter of credit works. 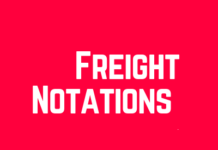 However, the importers include some clauses in to the credits and manipulating them in a way that they require a document which can not be presented without an action of the applicant. Joker Clauses can be seen either in Field 46-A Documents Required or Field 47-A Additional Conditions. Below you can find some examples of so called Joker Clauses. Example 4: Original beneficiary’s invoice duly endorsed on reverse by two authorized official’s of the applicant. Example 5: Certificate of acceptance countersigned by authorized applicant’s agent. Example 6: Payments can be effected only after goods have been cleared from import customs. Example 7: Inspection certificate showing that goods have been inspected and delivered in good manner by an inspection company to be named by applicant after shipment. What Should an Exporter Do After Finding One of These Joker Clauses in its Letter of Credit? 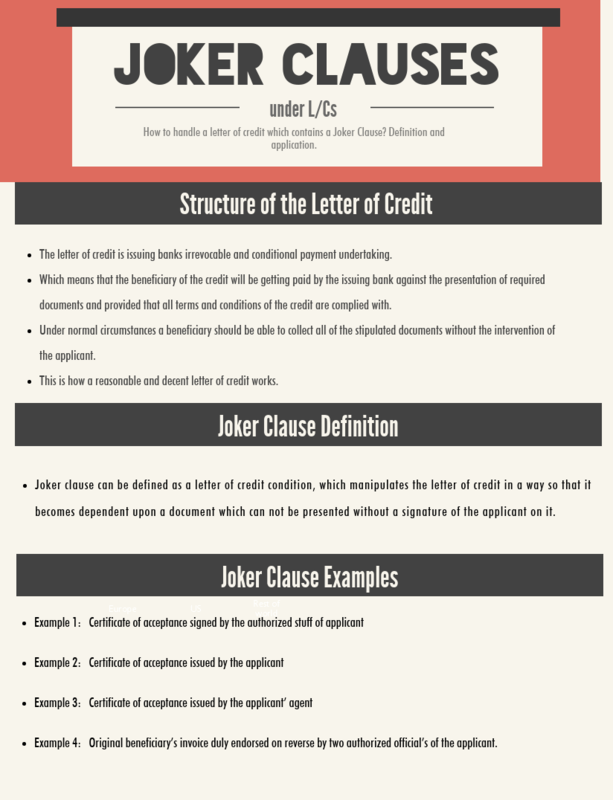 Joker Clauses disrupt the structure of the letter of credit. ICC discourage issuing banks to include any Joker Clauses in to the credits. Despite all of these efforts, it is possible to see joker clauses in the letters of credit. Let me try to create a road map for these situations for the beneficiaries. Step 1: Read the credit very well. If you can not determine whether any joker clause have been added to the credit or not, apply for a professional assistance. Step 2: If you find a Joker clause in the credit, reach to your customer. Explain your customer that the Joker clause is unacceptable for you. Demand an amendment. Step 3: The amendment should be advised to you within 3-10 days, after your customer gives necessary amendment request to the issuing bank. Amendment will be advised through the same advising bank, which had advised the original credit to you. 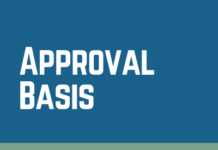 Step 4: Once you received the amendment from the advising bank, you need to re-check it in order to make sure that the Joker Clause has eliminated. If the letter of credit contains conditions that the beneficiary (exporter) cannot fulfill without cooperation with the applicant (importer) or a party contracted by the applicant, then this is known as a conditional letter of credit or a “Joker Clause”. Beneficiaries should delete these kind of clauses from the credits. Otherwise they will be facing a non-payment.